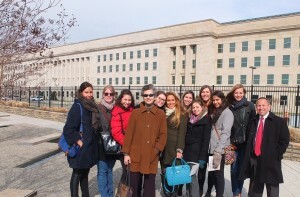 A group of ISH residents participated in a very special visit to the Pentagon on March 27, 2014, which began with an informal meeting with US Secretary of Defense Chuck Hagel in his office. ISH Board members Andrew Ammerman, Senior Executive Advisor to the Pentagon Memorial Fund, and Barbara Slavin, Chairman of ISH’s Committee on International Dialogue, organized this program which included a tour of the Pentagon and the 9/11 Memorial. 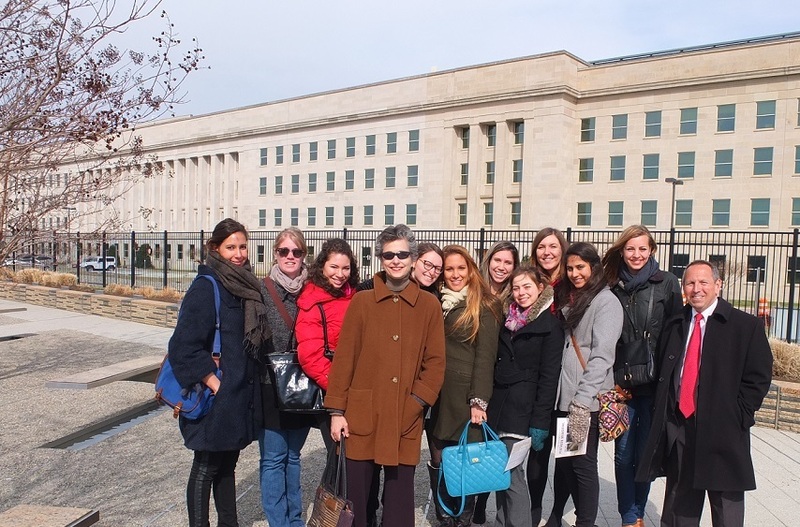 The visit included a discussion on the history of the Pentagon, the tragic events of the 9/11 attack and first response, as well as the conception and design of the outdoor Pentagon Memorial and future plans for the 9/11 Pentagon Visitor Education Center. The tour also included a visit to the internal crash area memorial and chapel, and the outdoor memorial.